In a world of voice over for animation, Dave Fennoy is a King. I caught up with Dave while he was in town for the DragonConn convention where he was represented as one of the voices of the video game “The Walking Dead”. 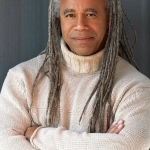 You may know Dave Fennoy as the voice of Hulu. But over his 20 plus year career as a voice actor Dave has been the voice for Promos and commercials for Fox, the WB, Starz, TV One, Disney Channel, McDonalds, Corona, Lexus, AT&T, Chrysler, Starcraft 2, Thats So Raven, Spiderman and many, many more brands. But although this A list VO talent keeps a busy schedule voicing projects and traveling internationally with Comicconn conventions, I found him to be down to earth and easily accessible. I found out that Dave would be in Atlanta by following him on Facebook. I remembered that a friend and fellow talent Kozmo Miller was a personal friend of Daves and had received coaching and mentoring from him early in Kozmos career. So I called Kozmo who reached out to Dave who was connecting flights to Atlanta in Phoenix. Dave was receptive to the idea and not only granted me the interview, but also allowed me access to his live panel discussion at DragonConn. In the two days I spent with Dave Fennoy and I found him to be outgoing, funny and super knowledgable, all of which add value to his voicing abilities. It was easy to understand how he had booked with so many high end companies. We talked about a wide range of things, from his career, to how the average person could transition from their careers into being a voice talent. 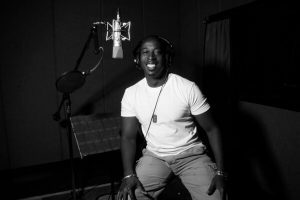 He provided valuable information on animation voice over, auditioning and the work that’s involved after booking a job. One of the most popular video subjects on YouTube amongst Voiceover Talents and recording enthusiast is the subject of what’s in your studio. This topic, no matter how many times its posted and how many ways it’s recorded, always seems to get thousands of views per video. But this video is done with a twist. I show off and explain my studio using my Gopro Hero Black 3 Edition with a first person view. With my camera strapped to my head, I show you the main elements that keep my studio operating. Why do people show off their home studios? Some of it is bragging of course. But some of it adds real value to people who are looking to build their own home studio. Many talents are also audio engineers and have expertise in acoustics and pro audio gear and can help other voice talents create the best and most professional sound. Sometimes Voice Talents create these Youtube videos to showcase to clients that they are working with the best gear themselves. But for me, I just wanted to share. In the spirit of creating great online video content, I wanted to take you on a journey into my world and where I work. Just as a Dr. has a stethoscope, these are the tools that make a great voice actor sound amazing. A pro studio helps you land the job by telling the client that you are serious about your craft. And over the years, I have shown clients how serious I am. 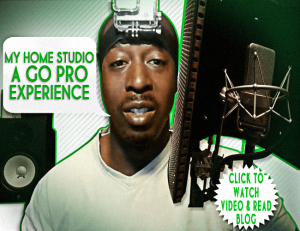 Home recording studios are the center of much controversy too. It gets Voice Talent and audio engineers debating about how much do you really need in a studio to get the best sound. It pits Mac users against P.C. users and friends against one another. (OK, I’m not sure about that last part). But with technology constantly changing, making the home voice over studio smaller and less expensive, it makes you wonder why we even need ALL this stuff… or if we will need it in the next few years. For now I enjoy my home voiceover studio and all its bulkiness because size does matter in this case. It creates great sound that clients appreciate. For a while, bigger is better for me. Whats in my voiceover home studio. Voice Over Talents aren’t used to being seen, but as of last week, Dane Reid will have a new video in a series that fills a void in the voice over community. For close to 10 year this New York native and voice over professional has made his living by being heard and not seen; Something opposite of what we were taught as children. But when he is seen out in public and networks within Atlanta and elsewhere, he is usually asked the same few questions about his curious profession. Most often he is first asked “How did you get into that? which is followed by “You do have a nice voice.” and then “I’ve been told I should do voiceovers. With so much curiosity surrounding his job, he decided to produce a series of Youtube videos about voice over. Certainly the idea is not new, but what Dane brings to it is a fresh fun energy. Many Youtube videos made by voice actors today lack entertainment value, scripting, viewer engagement or cutouts in the scenes. Dane Reid sought to change that and still allow viewers to follow a real life voice actor throughout his day. Additionally Reid journeys to other cities towns and countries in search of voice work. Viewers watch him do auditions, commercials and even interview some the industries big voice over Superstars who share their stories and knowledge. Shows air on Tuesdays at 7am online and his blog can be read and watched at his website DaneReidMedia.com by clicking the banners. With so many voice over newbies and aspiring talents, this new blog and channel are a must see. What does a Voiceover Talent do when he has no computer? In this day and age most of us are very reliant on our computers: for keeping in touch with family and friends, for entertainment, and if you are anything like me, doing voice overs. When my PC displayed the most terrifying message that any PC owner can ever see… the dreaded BSOD (otherwise known as the “Blue Screen of Death”), I was left with downtime to fill until it was repaired. Whether PC or Mac, occasional computer problems occur in all businesses. But in a small business that relies on its computer to produce its sole product, time is critical. While my good friends at Next Level Computers Ricky and Dave came to my rescue, needless to say, I had some free time on my hands. I have produced hundreds of commercials and done countless voiceovers with this computer. It stays running most of the day and night and gets little rest and takes a lot of abuse. So regular maintenance is essential; Regular maintenance that I don’t perform. So what does a PC-dependent Production Pro do when his computer goes down? For a full time voice talent, social networking is important and a good way to fill time, but without a computer, social networking is difficult to do. Instead, I found myself wasting time watching TV, searching for lunch and even grooming. But none of that earns you money. Some people will find this fodder for the PC/Mac debate but the truth is that I am also a Mac user who has sometimes serious issues with my MacBook Pro. So no, this is not the forum for that debate. Now you tell me, what goes down when your PC goes down?